DVD's $20.00. Please add $8.00 for shipping and handling. Once you have choosen which DVDs you would like to purchase, please click on the "Shop" link above to place your order. The Five Elements of Traditional Chinese Medicine are a comprehensive template that organizes all natural phenomena into five master groups or patterns in nature. Each of the five Elements,—Wood, Fire, Earth, Metal, and Water—include categories such as a season, a direction, a stage of growth and development, internal organs, emotions, an animal, a taste, a color, a sound and more. The Five Elements Theory reflect a deep understanding of natural law, which is "nature naturally seeks balance." Understanding this helps us to recognize and address where imbalances in our body, mind, emotions, and spirit lie. 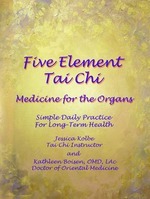 In this hour we go over 5 Element Qigong practices associated with Organs, Sounds and Emotions. Exercises include: 1. 5 Healing sounds: Internal vibrations which balance organ health. 2. Massage the organs: External vibrations and get the blood and Qi to flow. 3. Wood: Tree flowing with the breeze. Fire: Flying goose. Earth: Balancing yin and yang. Metal: Playing accordion. Water: Dragon washes its face. 4. 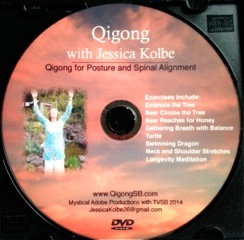 Five Element Qigong: Moving meditation flow for organ and emotional Health. This is a Wudang version of the classic 8 Brocades. Master Zhou shared this form with Jessica in the Fall of 2018 up high in the Wudang Mountains of China. Wudang is a Daoist Sacred Mountain and is also known as the birthplace of Tai Chi. Practicing The 8 brocades will make you stronger, clear your mind, improve your focus, and will energize you. This hour long class begins with easy Wudang warm up exercises. 7 Precious Gestures was created by Dr. Roger Jahnke. 4 Precious Gestures and 3 Very Precious Gestures help us to clear old stagnant Qi (physical, emotional and mental) to pave the way to a healthier and more satisfying way of living our lives. After practicing these exercises for over 10 years, Jessica shares the insights she has gleaned and lead us through these lovely movements. Also included are warm up exercises for the neck; Dragon Horns And Long Neck Crane, heart opening Flying Goose and Yin and Yang cleansing to get the energies flowing. The seven precious gestures are Beat the Heavenly Drum. Absorb and Dispel, Gather and Release, Calm in the Center of the Storm, Waiting at the Temple Gate/Breathe your Prayers and Swallowing the Golden Pill of Immortality. Enjoy a one hour class of embodying and practicing healing exercises from the Animal realm. 1. Dragon, for power, strength, and good luck and for the ability to rise over circumstance and see things clearly. Lots of spirals for all the joints. 2. Phoenix, for rebirth and renewal. Developes resilience and learning from life’s challenges and coming thru them with new insight and knowledge. Breathwork and shoulders. 3. Frog, for prosperity and abundance. Also for a physical, emotional and spiritual cleansing. good for leg strength and balance. 4. Butterfly for transformation and revealing your true beauty. Good for back, arms and shoulders. 1. Snake, for creating your own medicine. for a supple spineand for developing fast twitch muscles. 4. Deer for cultivating forgiveness, balance and leg strength and flexibility. Qigong exercises were invented by Daoist Scholars who looked toward nature to learn how to live long and healthy lives. They realized that keeping the Jing energy of the kidneys healthy, was key to a long life. They looked to animals and plants in nature with particulary long life spans and created exercises to encourage long lives for humans. In this class you will learn to stimulate the Jing energy in the kidneys and how to keep your fluids flowing, including swallowing the elixir of youthfulness. Other exercises include Bear, Elephant, Tortoise, Whale and Tree. Learn wonderful exercises to reduce pain stiffness in your neck and shoulders due to stress, tension and injury. Follow along with Jessica as she goes over self applied massage techniques and exercises to streghthen release tension from these areas of the body. Exercises include Monkey Stealing Earth Energy, Elephant, Spinning Teacups, and mayofascial release techniques. Follow along with Jessica as she demonstrates the Qigong and Tai Chi that she learned from Master Zhou Jing Bu in the Wudang Mountains in China in 2017. 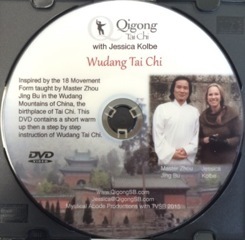 This DVD contains a short warm up and a step by step instruction of Wudang Tai Chi. The Qigong is simple yet powerful. The Tai Chi beautiful and calming. You will want to practice this everyday! These exercises are designed to open your heart to joy and your creative nature. Exercises include Expanding your Horizons, Clearing the Heart Mind, Collecting Qi, Yin Yang Flowing, Massaging the Heart, Stretching exercises, Balance exercises and Flying Crane. These are some of Jessica's favorite exercises including Dolphin, Snake, Parting the Heavens, Parting the Earth, Clearing the Heartmind, Breathe your Prayers and Crane Frolics. Feel great and relaxed! This hour long Tai Chi Easy class includes philosophy, Vitality method warm up exercises, seated, standing and walking Tai Chi Easy. Tai Chi Easy is a method created by Dr. Roger Jahnke and is practiced all over the US and in our VA hospitals. It makes Tai Chi "easy "and accessible to all. This hour long class honors 2017 Year of the Fire Phoenix/ aka the Rooster. Symbolic Meaning of the Phoenix: Life, Present Moment, Magic, Purity, Clarity, Rebirth, Renewal, Longevity, Creativity, Protection, Immortality, Resurrection, Reemergence and Transformation. Exercises include Becoming the Phoenix, Building the Funeral Pyre, Phoenix Rising, Soaring Phoenix, The Phoenix and the Snake, Phoenix Swimming with the Dragon and more. The perfect companion to Dr. Roger Jahnke's best selling book, The Healer Within! Practice all the exercises described in the book. Self applied massage, breathing exercises, intentional movements and guided meditations are featured in a slow relaxed pace. This class is mostly seated. You will feel wonderful and peaceful as you activate your own healing abilities. Practice fun and easy exercises to improve balance. As we age there are many factors that can affect our balance: failing eyesight, medications, degenerating bone and muscle strength, more time spent sitting, strokes and disease. The good news is that we can improve our balance very quickly. This DVD has lateral balance exercises, forward/ backward balance exercises as well as twisting balance exercises. Included are fast twitch muscle exercises that will condition you to break a fall should you lose your balance. This class focuses on activating your inner powers. Your power to heal your body, your power to heal your emotions and your power to clear your spirit of self judgement and criticism. Inspired by the 10 Phases of Qi, developed by Dr. Roger Jahnke O.M.D in his book, The Healing Promise of Qi, we begin by expelling toxic Qi from our bodies, minds and spirits. Then we invite new healthy energy into the spaces we have created. Also included are exercises that help to remove the blocks that are keeping us from reaching our true potential of health, happiness and peace. This is very powerful Qigong! Warm up exercises are included. These exercises will help you to become clear if there is confusion and uncertainty in your life. Exercises include Parting the Earth to mine the gold, Parting Heaven to reveal insight, Looking into the window of Clarity, Calm in the Center of the Storm, Monkey Frolics and more. Summer exercises will cool you down! Release the fire in your heart with Dragon's breath. Cultivate Joy and Creativity as we release busyness and feelings of being overwhelmed. Find balance and grace with Crane Frolics and a lovely long kata, White Crane spreads its Wings. Stress affects us physically, emotionally and spiritually. You will feel relaxed and relieved after this hour seated class. Release tension with Whale Breath. Relax muscles with self applied massage techniques for the head, neck and shoulders. Learn Lymphatic Drainage massage to keep you healthy. Relaxing guided meditations included. These are exercises that are great for the spring time. Exercises include Cleaning the Temple, Releasing anger and Water Wheel. The Spring is a time for Renewal, Rebirth and a little spring cleaning. These make us feel youthful, like anything is possiblel and full of vitaliity. Master Teacher Gayl Hubatch OMD leads us through a 45 minute Qigong class. She warms us up with breath-work and slow intentful exercises for our joints. 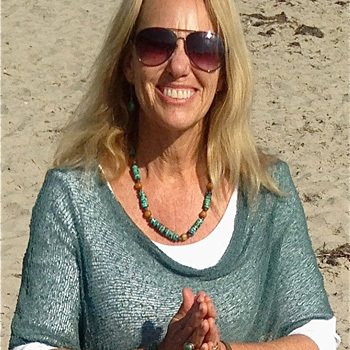 Gayl shares her favorite Qigong exercises that will make you feel wonderful. 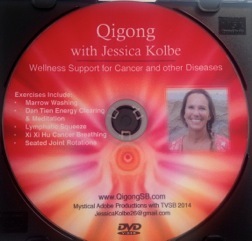 This DVD consists of exercises for our bodies, hearts, minds and spirits. Release old energies by Shaking, Banging on the Heavenly Drum and Warriors Breath. Stretch you body with side bending and practicing Elephant. Re-energize your being by Gathering from Earth and Heaven, Inner Rivers Flowing and by Clearing the Small Universe. Soothe your emotions and mind by practicing Hands like Clouds, and _Opening the Heart Mind Gate. Invite balance with Walking on Clouds and Harmonizing Yin and Yang. Calm and connect with your spirit with Metta Meditation. Jessica demonstrates the 18 movement form she learned from Master Zhou Jing Bu in the Wudang Mountains of China in 2013. This DVD contains a short warm up and a step by step instruction of Wudang Tai Chi. Learn the story behind the movements and follow the Qi flowing in and around you. 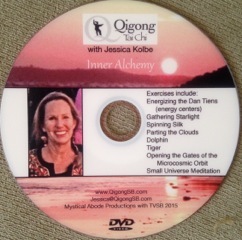 Discover the Alchemy that is possible bt practicing Qigong Exercises and Meditations. Energize your body, heart/mind and spiritual centers. Open the gates to your organs, meridians, chakras and intuitive powers. Activate and illuminate the microcosmic orbit inside of you. Conclude with Thich Naht Hanh's Small Universe Meditation. Practice Qigong at sunset on the beach and relax into your joints and tendons. Exercises include; Tree sheds its Leaves, Joint Rotations and Massage, Ocean Breathing, Elephant, Dragon Catches Raindrops, Swimming Dragon, Flying Dragon, Monkey Steals Earth Energy, Butterfly, Peacock and Breathe Your Prayers. Master Teacher Shems Heartwell leads us through a 45 minute Qigong class. He warms us up with breath-work and slow intentful exercises for our joints. His deep and insightful way of sharing his favorite Qigong exercises will make you feel wonderful. 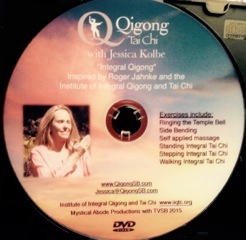 Inspired by the teachings of Dr. Roger Jahnke and the Institute of Integral Qigong and Tai Chi. After a brief warm up, learn a beautiful 9 movement Tai Chi form that you can practice sitting, standing, stepping and/or walking. Relaxing Chinese music plays in the background as you follow along with Jessica as she leads you in the movements. Descriptions and symbolism of each movement adds depth and intention to this profound Tai Chi form. These exercises aid viewers in feeling better, hopeful, peaceful and healing. This DVD shares what Jessica has found to be most effective for those facing the challenges of illness and will also benefit their support team. Exercises include Xi Xi Hu Cancer recovery breathing, lymphatic pumping, Marrow washing, gentle seated stretching and joint rotation, Dan Tien Clearing Meditation. Guest, Master Li Junfeng is one of the true Qigong masters in our lifetime and is the driving force behind bringing Sheng Zhen Gong, the Qigong of Unconditional Love, into this world. Master Li shares his beliefs on love, Qi and his big picture view of Qigong with Jessica in a 12 minute interview. Master Li then demonstrates standing Heaven Nature Gong as Jessica follows along from a chair. Guest, Master Ed Rockett, shares with Jessica inspirations and insights from his 40 years of practicing Tai Chi and Qigong. Master Teacher Ed Rockett, leads us through a 45 minute Qigong class. He warms us up with breath-work and slow intentful exercises and then demonstrates Longevity Gong, a beautiful and poetic form of Qigong. Guest, Dr. Roger Jahnke O.M.D. One of the worlds leading teachers and authorities on Chinese Medicine, is just back from Washington D.C., and shares with Jessica the state of health care in the United States right now. Dr. Jahnke, anuthor and Qigong expert, then leads a 45 minute Bu Zheng Qigong and Vitality Enhancement Method practice. You will learn a lot about Qigong from a true master and feel relaxed and energized after the practice. Liver and Kidney. Focus on the releasing anger and resentment. Exercises include Water Turtle, Dragon, the long Wudang Qigong form and Crane Frolics. Lungs and Kidneys. Focus on releasing fear and doubt and inviting change into your life. Exercises include Phoenix Rising, Snake sheds its skin, Butterfly, Warriors Breath and and Walking on Clouds. Focus on acupuncture points, joints and tendons. Exercises include Tendon Washing, Sleepy Tiger, Dolphin, Marrow washing and self healing technique. Focus on Dr. Hua Tuo's classic Animal Frolics and other animal exercises. 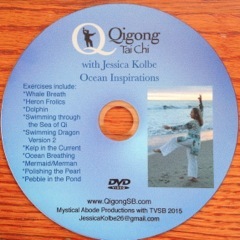 Fun and light hearted presentation that was featured at the Insitute of Integral Qigong and Tai Chi convention in 2011. Exercises that will help with Fear, Grief, Anger, Confusion, Shock, Resentment, Doubt, Drama and Feelings of Being Overwhelmed. Sign up for the QigongSB email list to receive information about upcoming class schedules and events. Carpinteria is celebrating World Tai Chi and Qigong Day with Free classes from 9:00-11:00 on Linden City Beach. Combine joyous Nia movements with healing Tai Chi energy work. Dance your life story and free yourself emotionally. Join Jessica and Ray Kolbe on a trip of a lifetime. This is a spiritual retreat focusing on practicing Tai Chi and Qigong in the Sacred Taoist Wudang Mountains. If you want to be healthy and live to 100, do Qigong. China May 3- May 22, 2020. Join Ray and Jessica Kolbe on a spiritual retreat that will focus on study of Tai Chi and Qigong in the Sacred Mountains of China. Learn more about this trip of a lifetime! Enjoy an hour long Tai Chi or Qigong class with Jessica anytime and anywhere! There are over 30 classes to choose from.